Above: 28th January was Chinese Spring Festival Gala eve. CCTV's popular host Li Yong (right) with a lady from Hong Kong. Photo gallery below. Chinese Spring Festival is a week long family celebration. Migrant workers visit their homes. Dumplings and fireworks. 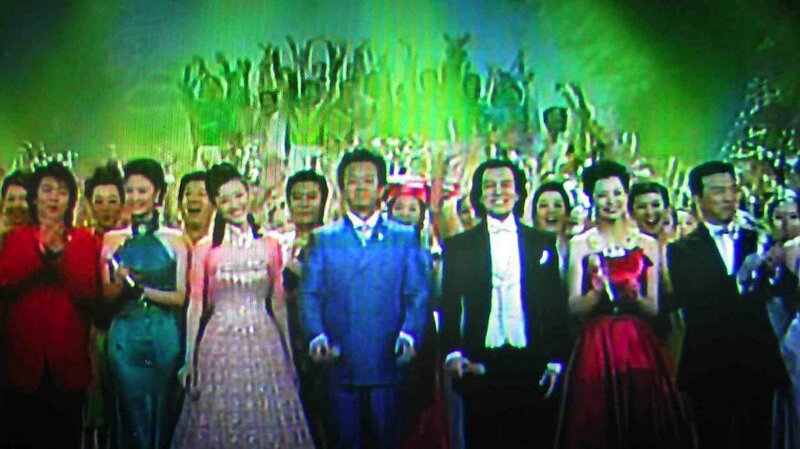 Spring Festival eve is China's most important TV night, over 95% of Chinese watch the show. January 29th was officially the first day of Dog Year. Chinese mobile operators made new records as Chinese sent 100 million SMS text messages with their mobile phones. At peek hours China Unicom delivered 1000 messages per second and bigger China Mobile 4000 messages per second. 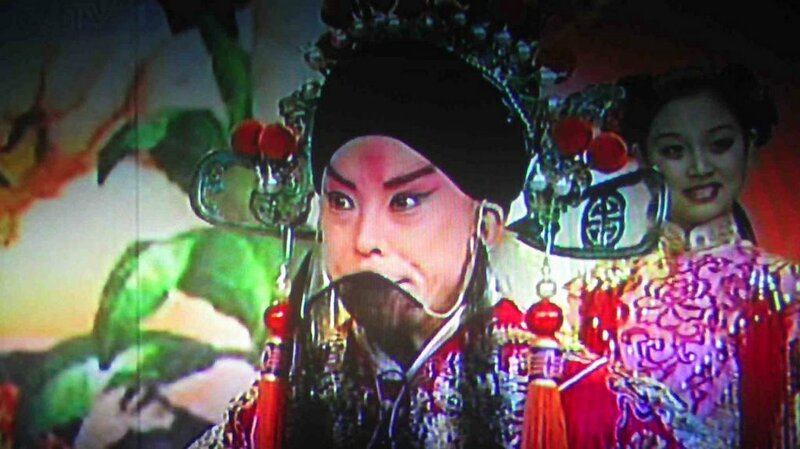 CCTV's show shows Chinese culture elements: acrobats, cross-talk shows, Peking Opera, ballet, and singing and dancing. Most of the Spring Festival text messages contain Chinese word games or poetry. When a clever SMS gets written and received, it may be forwarded tens of thousands times. Hmmm... Dog Year, or better maybe as the SMS Year! Above-1: Chinese Spring Festival Gala TV-show 28th Jan 2006 on CCTV. Popular quiz host Li Yong (left). 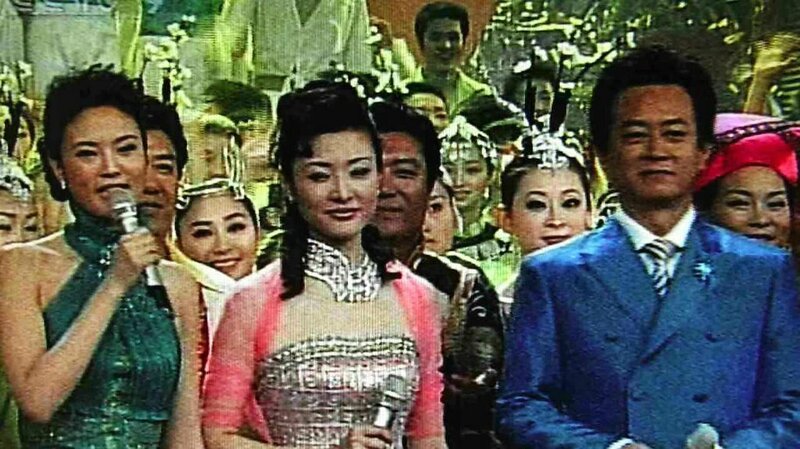 Lady in the middle is Dong Qing, CCTV program hostess. Gala show took 5 hours. Above-2: Spring Festival Gala TV-show 28th Jan 2006. 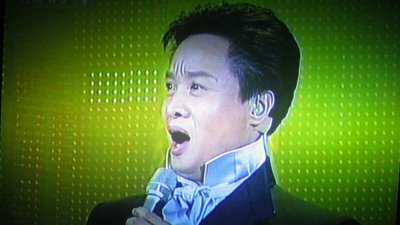 Famous pop singer since 80s, Cai GuoQing. 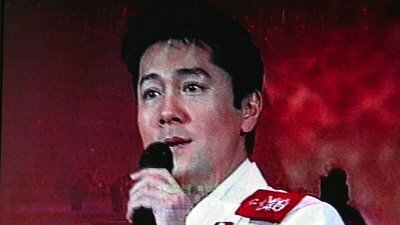 He sings in the events for workers in China's provinces. Above-3: Spring Festival Gala TV-show 28th Jan 2006. 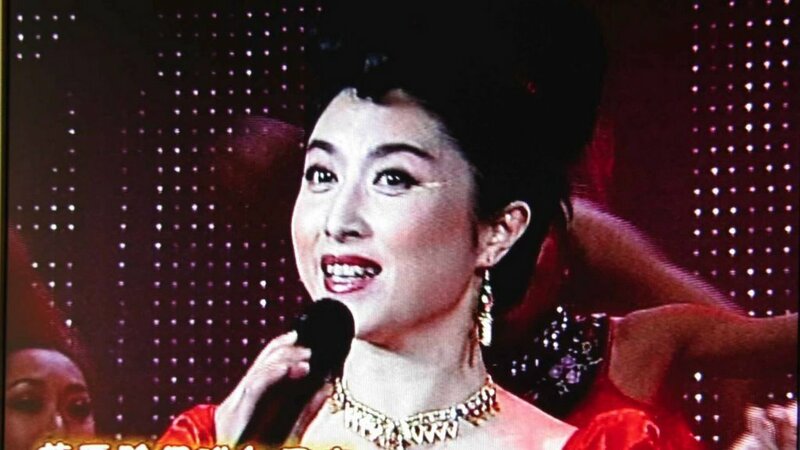 This lady is Huang WanQiu, well known for "Liu Sanjie", a singing debate movie from 50s. 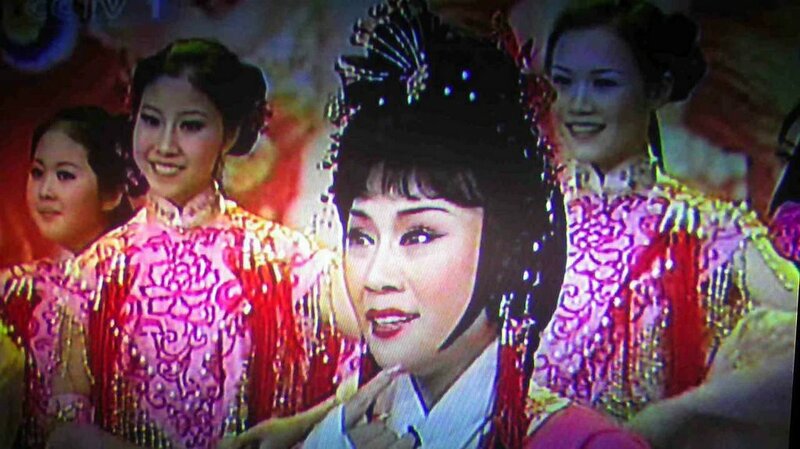 Above-4: Spring Festival Gala TV-show 28th Jan 2006. On left, Ke Limu from China's West, Xinjiang. 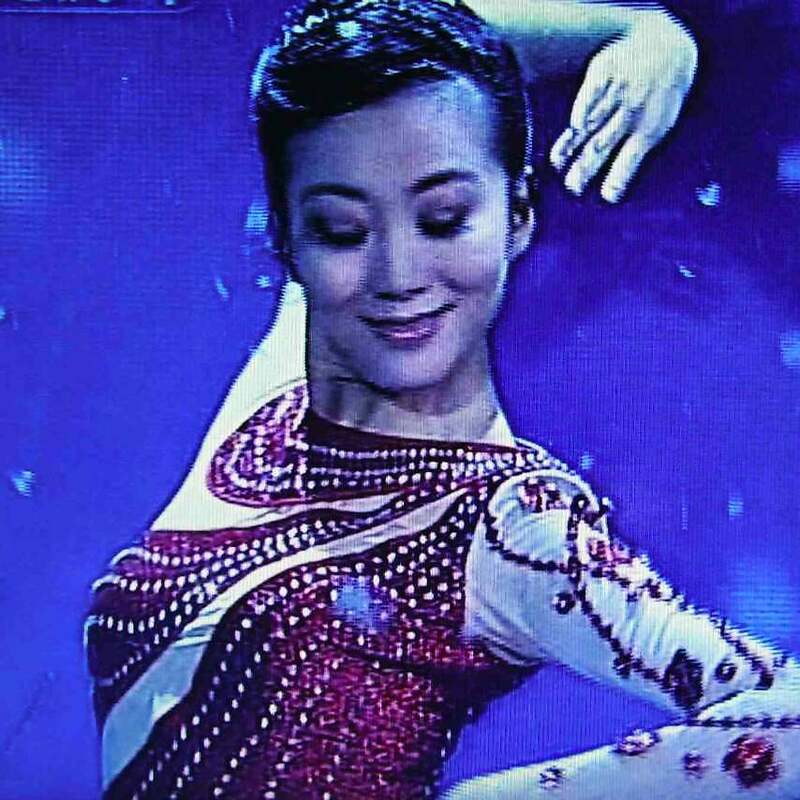 Ke Limu belongs to Singing and Dancing Group of Peoples Liberation Army (PLA). 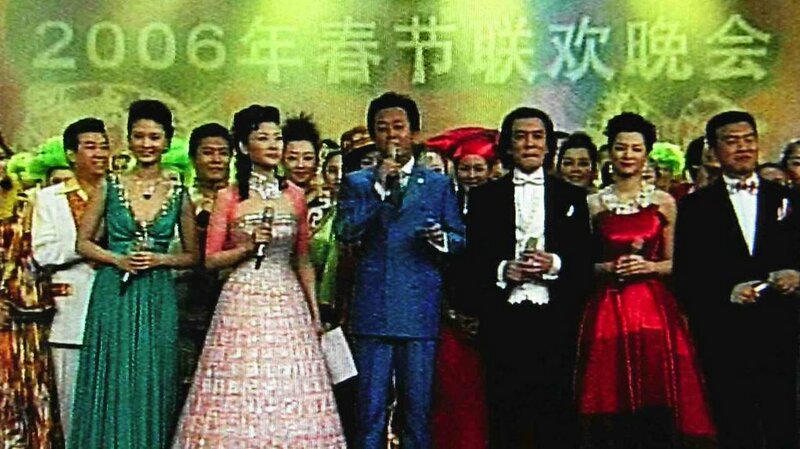 Above-5: Spring Festival Gala TV-show 28th Jan 2006. 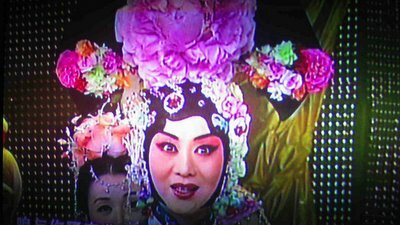 CCTV hostesses from every Chinese provinces bringing riddles reflecting their local culture. 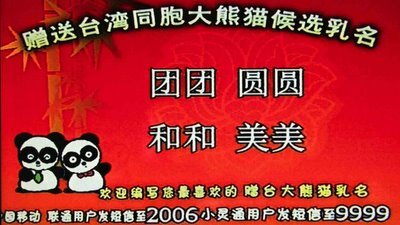 Chinese text: "2006 Spring Festival Gala". Above-6: Spring Festival Gala TV-show 28th Jan 2006. 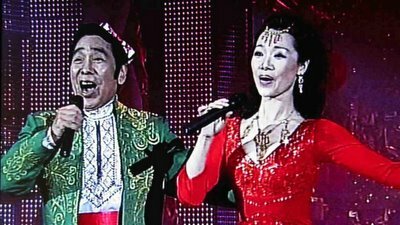 These singers belong to Peoples Liberation Army (PLA). They represent Air Force, Navy, Army and Armed Police. 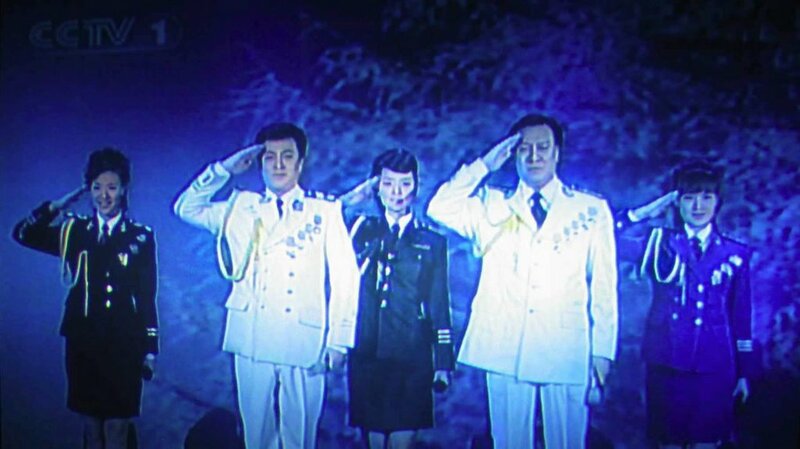 Famous Tong Tiexin on the right in white uniform. Above-7: Spring Festival Gala TV-show 28th Jan 2006. 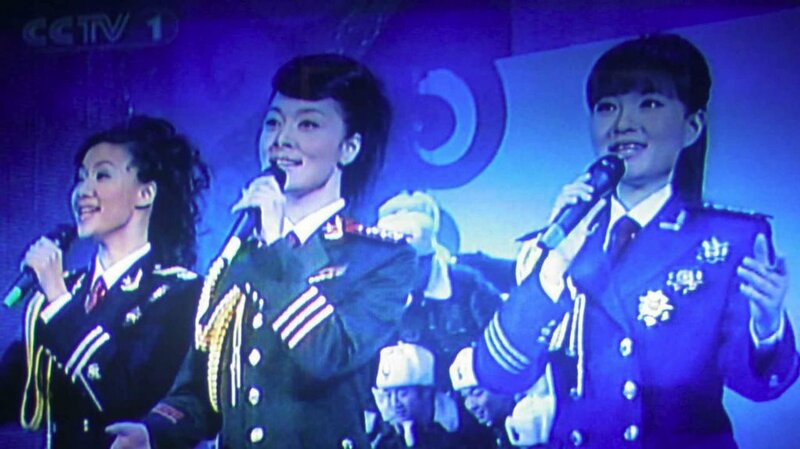 Peoples Liberation Army lady singers. Singing and dancing is important entertainment in PLA. 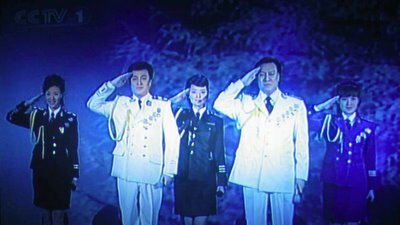 Military choruses of China often have own TV-shows: disciplined singing and marching. Above-8: Spring Festival Gala TV-show 28th Jan 2006. 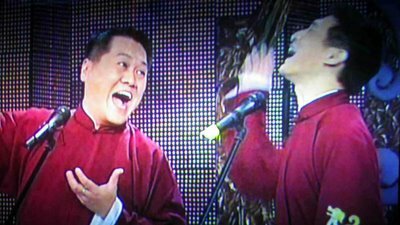 On the right, famous singer Zhang Ye. 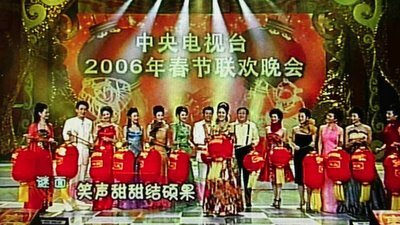 Above-9: Spring Festival Gala TV-show 28th Jan 2006. Introducing a probable future star. 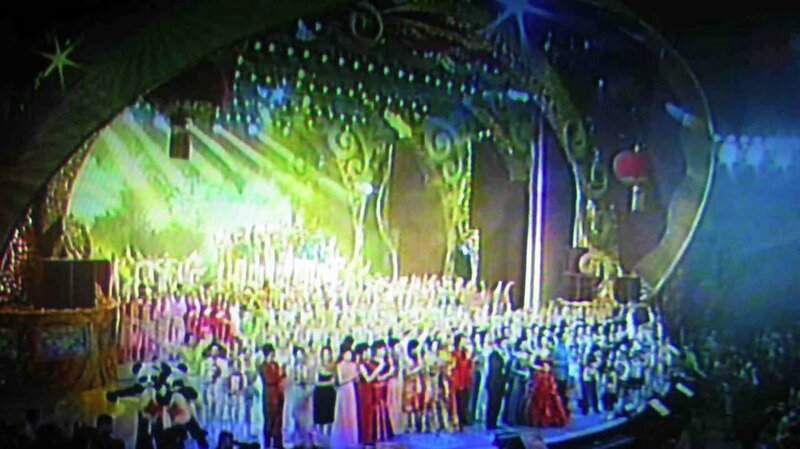 Above-10: Spring Festival Gala TV-show 28th Jan 2006. Full speed! According to survey, Gala show is watched by 95% of Chinese. Above-11: Spring Festival Gala TV-show 28th Jan 2006. Acrobats from Shenyang, a 10 million inhabitants city one hour flight North from Beijing. This group has won World Acrobatic Award. 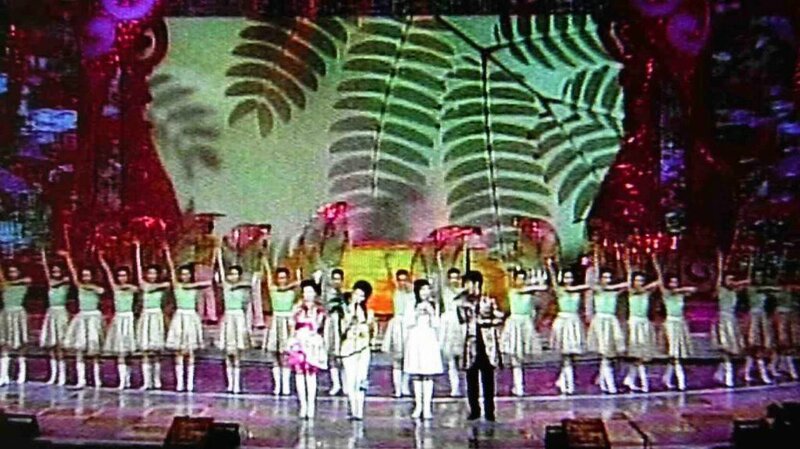 Above-12: Spring Festival Gala TV-show 28th Jan 2006. 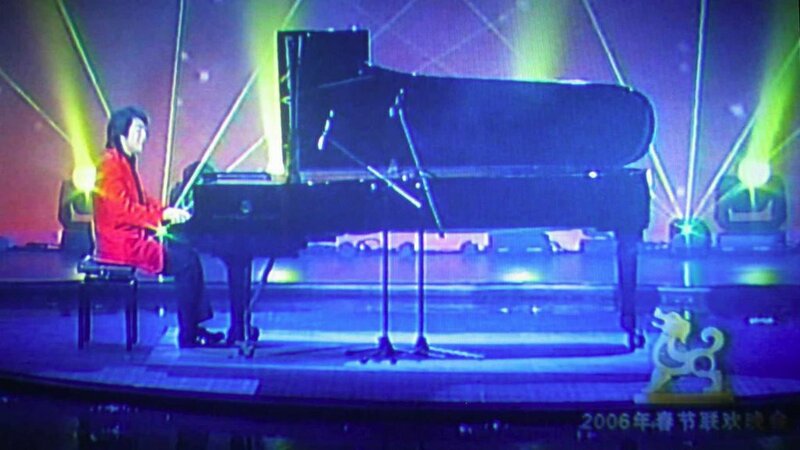 He is Lang Lang, probably No.1 pianist in China right now. His style is entertaining, not traditional serious classical. Above-13: Spring Festival Gala TV-show 28th Jan 2006. Her dancing was more than ballet, perhaps acrobatics. Above-14: Spring Festival Gala TV-show 28th Jan 2006. 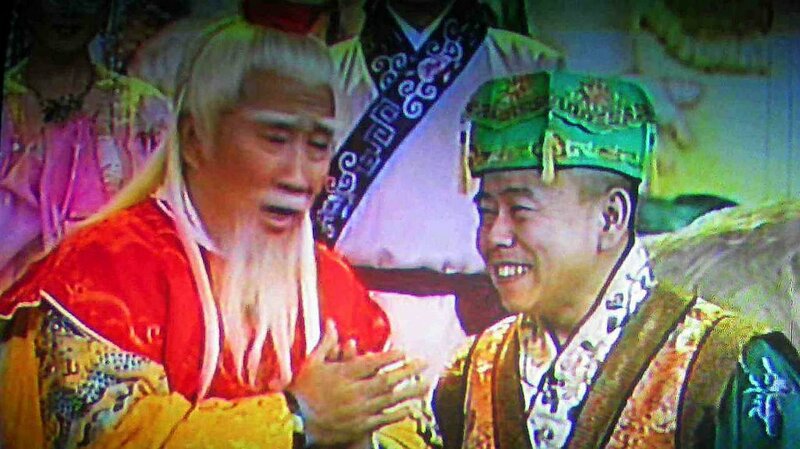 Humorous play by Song DanDan and Zhao BenShan, both top entertainees in mainland China. Above-15: Spring Festival Gala TV-show 28th Jan 2006. Some parts of the show were massive dance productions. The oldest dancer in one performance was 74 years old woman, she did fine! Her group came from TangShan, near Beijing, the city which was destroyed by a massive earth quake in 1976. 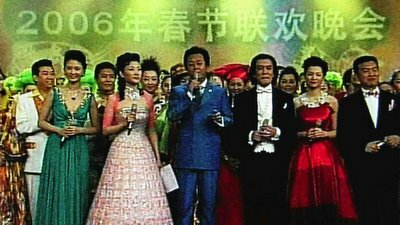 Above-16: Spring Festival Gala TV-show 28th Jan 2006. 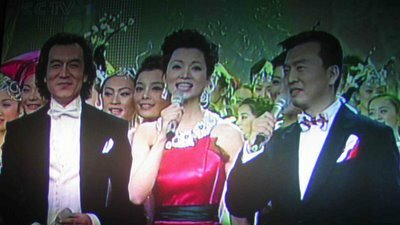 Famous Chinese TV celebrities Zhou Tao, Zhu Jun, Li Yong and Dong Qing. Above-17: Spring Festival Gala TV-show 28th Jan 2006. Taiwanese cross-talk stars. 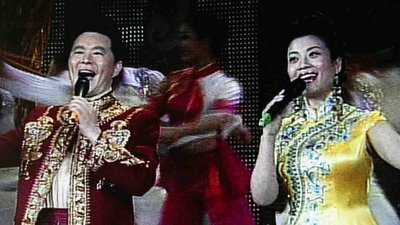 In mainland China there are about 1,2 million people from Taiwan, and many pop stars and artists from Taiwan are very popular. 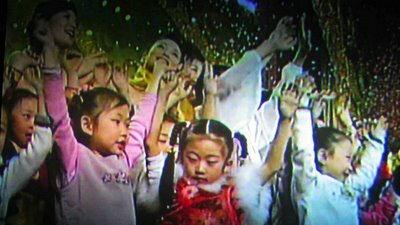 Above-18: Spring Festival Gala TV-show 28th Jan 2006. PLA's famous folk singer Yan WeiWen. Next day he was singing at PLA's own Dog Year Show for Chinese military personnel. 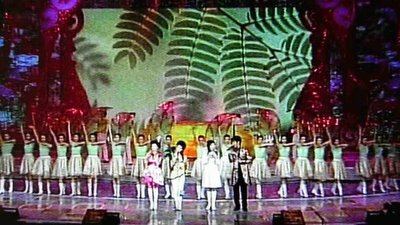 Above-19: Spring Festival Gala TV-show 28th Jan 2006. 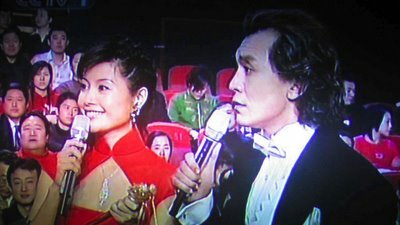 CCTV's program hosts Zhu Jun (right) and Zhou Tao (middle). Above-20: Spring Festival Gala TV-show 28th Jan 2006. 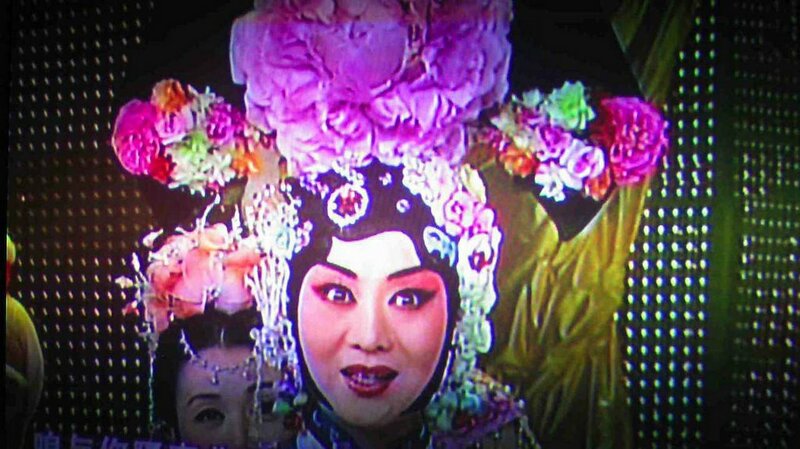 On the right, comedy star Pan Chang Jiang playing part in Huang Mei Xi (Anhui Opera style), a marriage story with happy ending. Above-21: Spring Festival Gala TV-show 28th Jan 2006. Peking Opera character singing Huang Mei Xi (Anhui Opera style), a marriage story with happy ending. Above-22: Spring Festival Gala TV-show 28th Jan 2006. Above-23: Spring Festival Gala TV-show 28th Jan 2006. Above-24: Spring Festival Gala TV-show 28th Jan 2006. Mainland China decided to give Taiwan two pandas. Their original names were No.16 and No.19, like Jackson Pollock's art works! Millions Chinese voted for the new names to pandas by using SMS and Internet. 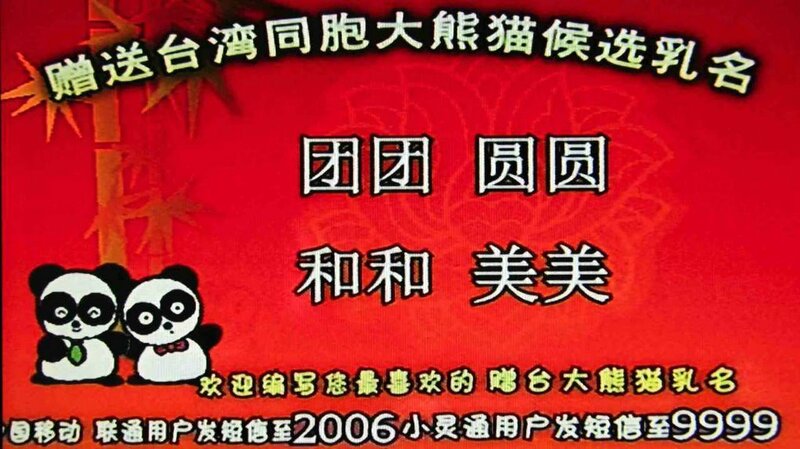 Winning names are TuanTuan and YuanYuan, meaning "re-union". A bit political. Winner of the voting received tickets to 2008 Beijing Olympic Games. Above-25: Spring Festival Gala TV-show 28th Jan 2006. Chinese children participated actively to Dog Year Gala. Above-26: Spring Festival Gala TV-show 28th Jan 2006. 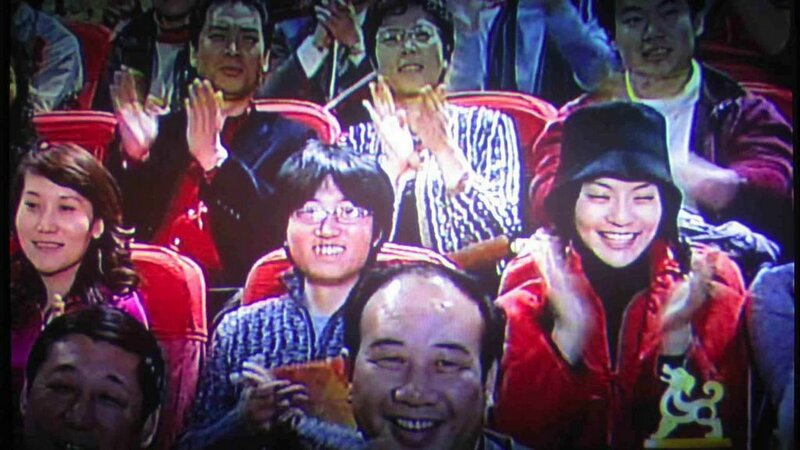 Stars and celebrities received applause by studio audience. Above-27: Spring Festival Gala TV-show 28th Jan 2006. Five hours of live show is over. Chicken Year is over. Dog Year is ahead of us, followed by Golden Pig Year 2007. 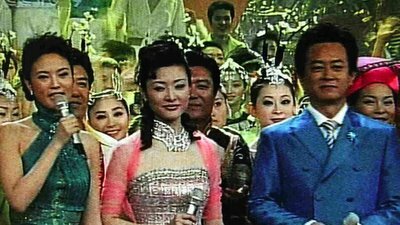 Above-28: Spring Festival Gala TV-show 28th Jan 2006. SMS: "In the next few days your mobile phone will be fulfilled with SMSs. Therefore, I decided to act earlier to occupy your space and expel the others. Happy Spring Festival! As you know, it is not easy to be the first nowadays"
SMS: "Time flies, Dog Year arrives, I give you care because you are cute. When asleep, get well covered by a quilt but leave your dog head out. Get a bone to bite, it's said it gives you calcium. Don't think that I am bad. Just wish you Happy Spring Festival!" SMS: "I here wish you a very Happy New Year. For more blessings, please see the other SMSes!" SMS: "The one who received this SMS will have joy. The one who read this SMS will have success in work. The one who saved this SMS will have sweet love. The one who forward this SMS will have great prosperity (no royalty charges needed). The one who deleted this SMS will still have a good luck. Wish you a Happy New Year!" SMS: "The New Year is coming. I wish you health, career prosperous, family happy and harmonius, and everything goes as you wish. Wish you a better next year!" SMS: "Mobile phone suddenly vibrates. Little pig has to see. Pig feet clicks. Gets another SMS bomb. Pig kicks with anger. Stupid pig, just be happy and forward to the other dumbs. Wish you a happy Spring Festival!" 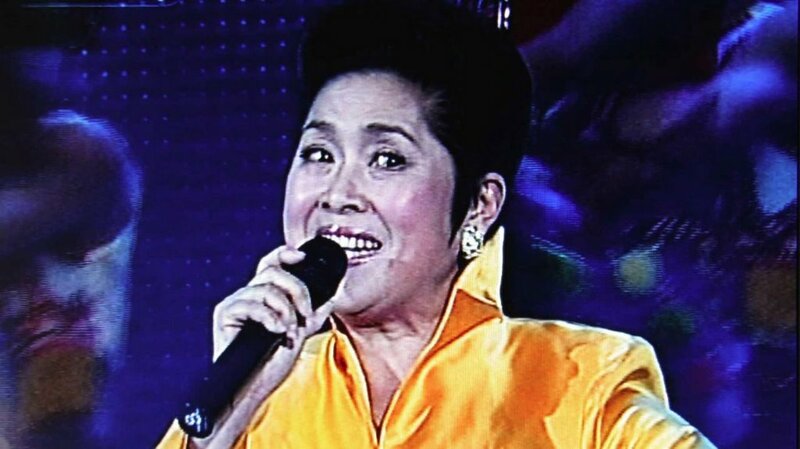 SMS: "New Year drums took away our one year time; left us one year story; brought us the hope; gave us the blessings. Wish you a Happy New Year!" SMS: "Good luck and happiness fall when Spring Festival arrives. Wish you and your family healthy and joy!" SMS: "Hardship, exhaustion and flows of tears for you. Wish you a pleasant Spring Festival"
5. Please do not forget me"
Dog year start brings all the success"
Wan Shi Ru Yi (= anything goes as you will)"